HAPPY NAILS OF FASHION VALLEY MALL! Welcome to Happy Nails Of Fashion Valley Mall! Happy Nails Of Fashion Valley Mall is the best nails salon 7 years in the row by a famous magazine that provides professional services, Happy Nails Of Fashion Valley Mall is the ideal place. 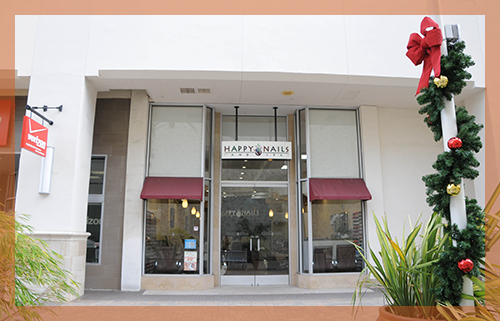 Located conveniently in San Diego, CA 92108, Happy Nails Of Fashion Valley Mall welcomes you. Our commitment to you is our number one priority. As our guest, we hope that your stay with us is unlike any other. With our state of the art equipment and highly experienced staffs, our desire is to simply make each and every visit a soothing recovery from life in the real world. At Happy Nails Of Fashion Valley Mall, we take pride in providing you with all good products and qualified services to help you rejuvenate your beauty. You always feel friendly and welcome from our passionate staff who understand what you want. If you’re in need of nail treatments or want to see why so many San Diego residents come to Happy Nails Of Fashion Valley Mall, come to visit us today.